Bronwyn Chester BSW’81, the former associate editor of the McGill Reporter and the author of A Leafy Legacy: The Trees of McGill University, died on August 2 at St. Mary’s Hospital in Montreal of cancer at the age of 54. She is remembered here by her former McGill Reporter colleague Daniel McCabe. Then Diana did something unexpected. She got herself another job. My bluff had been called. Panic began to set in. The first item on my intimidating to-do list was to hire my own replacement. I interviewed some strong candidates, but one was clearly head and shoulders above the rest. And that’s how I met Bronwyn Chester. My only hesitation in hiring Bronwyn was that she seemed too qualified. She was older than me, more experienced, better educated and better travelled. Her CV made for interesting reading. Mine didn’t. Whatever concerns I had quickly evaporated. I couldn’t have asked for a more generous or good-natured partner in crime. In 1999, together with designer Eric Smith, we managed a rare triple feat in our profession, as the Reporter won awards at the regional, national and North American levels. Bronwyn’s contributions to the paper were instrumental. One of her articles, translated into French for the McGill News, received a prize from the Canadian Council for the Advancement of Education. She made plenty of friends at McGill and earned many admirers during her time at the Reporter. She was never at a loss for a lunch partner. I’ve always thought that the most important item in a writer’s tool box – apart from, y’know, the ability to string words together in a sentence – is curiosity. Bronwyn had no shortage of the stuff. There were very few subjects that Bronwyn didn’t find intriguing. I can remember several occasions of her arriving at the office, eager to talk about the night she had just spent watching the Faculty of Dentistry’s mobile clinic tend to the dental needs of homeless young people, or the interview she had just done with plant scientist Don Smith about innovative ways to grow healthy soybean crops. She couldn’t wait to share what she had just learned. Apart from the occasional skirmish over punctuation (I’m an em-dash man, she favoured semicolons), I can’t recall a single argument with Bronwyn in the three years we worked together, which isn’t to say that we always agreed about everything. She had a certain way of letting me know when she thought I was on the wrong path. Her brow would furrow, her eyes would narrow, her jaw would tighten ever-so-slightly. Whenever I got “the look,” I knew that, maybe, I should reconsider what I was about to do. Born in Vancouver and raised in Toronto, Bronwyn first arrived in Montreal to study social work at McGill and promptly fell in love with the city. Montreal wasn’t a place of two solitudes for her. She travelled across the language divide with ease, taking pleasure in everything that this city has to offer. 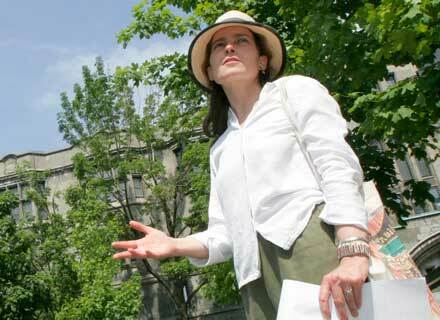 In 2001, Bronwyn wrote a feature story about McGill’s rich arboreal history for the McGill News. The article struck a powerful chord with many readers and launched Bronwyn into another phase of her career. Taking note of the strong response, the McGill Alumni Association invited Bronwyn to give a tour of the lower campus’s most unique trees to graduates during Homecoming. That initial tour was a hit and it led to many others. Bronwyn authored a 32-page booklet, A Leafy Legacy: The Trees of McGill University, offering readers detailed suggestions for two self-guided tours they could take part in. She began writing about Montreal’s trees for Spacing Montreal and then in a popular weekly column in The Gazette called “Island of Trees.” Her tree tours expanded to Mount Royal Cemetery and to other Montreal neighbourhoods. During her tours, Bronwyn didn’t just focus on the trees’ natural characteristics. She talked about how they tied into the history of their surroundings and about how the people who lived in the area interacted with them. She approached the job as a storyteller. I think that’s why her audiences responded so warmly. I recently listened to an interview Bronwyn gave to CBC Radio’s Mike Finnerty months ago. She talked about her cancer and the toll it took on her with matter-of-fact grace. Her chemo treatments would initially result in such neuropathic discomfort, she would struggle to dress herself. The next week, she would be back on her bike. The disease might place limits on her, but she wasn’t about to let it change who she was or how she wanted to approach her life. It is difficult not to feel bitter about the loss of a friend and colleague who should have had so much life left to live. But I can catch a glimpse of Bronwyn in my mind’s eye. Her brow is furrowed and she’s shooting me “the look.” She wouldn’t want to be remembered that way. Sometime soon, I’m going to go for a stroll on the downtown campus and I’m going to bring along a copy of A Leafy Legacy. I’ll visit the trees and treat myself to the pleasure of looking at the world through Bronwyn’s eyes. A commemorative ceremony for Bronwyn Chester will be held later this fall on the downtown McGill campus. Bronwyn lived up to her promises.